"Ski" crewed for Peter in RAAM 1996. Very strong long distance rider. Gets stronger when the going gets tougher. Completed solo RAAM 2000 successfully. As "High Wire" actor maintains power to the citizens of New York state. Married, resident of England. Born in the USA, served in 'Special Forces' of the US military Crewed for Pitre during RAAM2000 Active tennis player and strong cycling supporter Fluent in English, Spanish, and German. Noteworthy achievements are; award as International Man of the Year from the American Marketing association, the Million-Dollar-Sales Award from the Memorex Corporation, membership in the American Marketing Council, and accreditation as an ISO 9002 Service Provider from the UK Department of Trade and Industry. Massage therapist from Tucson. Former police officer , cyclist and runner. Building a practice in sports massage. Crewed for Peter in RAAM 1997 and for Jim in RAAM 2000. Accomplished ultracyclist. Official finisher of the Furnace Creek 508.Took Barry Bobbitt's place in Colorado. 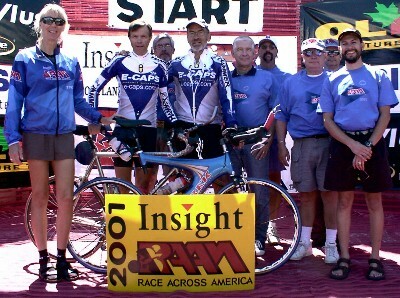 Crewed for Jim in RAAM 2000. Outdoors woman. Tandem cyclist.